Natural pools: better for your family, the environment and your pocket. 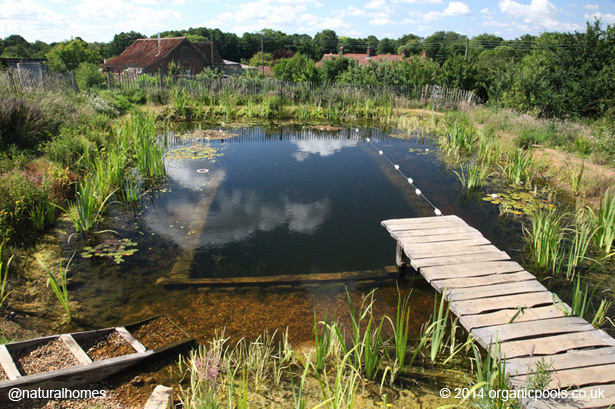 This is David Pagan Butler's natural organic pool at his home in the Norfolk countryside of England. A pool is one of Alexander's design patterns, No.64 'Pools and Streams' in which he notes, "...where nourishing contact with water is missing, then each project [home] should make some attempt, on its own and in combination with other projects, to bring water into the environment". A natural swimming pool is a magical addition to a home where you can observe nature throughout the seasons and be closer to the wildlife you share your land with. Some of the creatures you will attract are insects like water beetles and dragonflies; birds will visit the pond to bathe, feed and collect nesting material and amphibians like the frog and newt will take up residence. Your pond will become a stepping stone for the wilderness where local native flora and fauna will find your pool and flourish. A conventional sterile pool will typically cost around £50,000 ($80,000) but a 180 m2 (2,000 ft2) organic pool like the one above only cost David about £6,000 ($10,000) to make. You can find out how he did this in his DIY manual which is free to download from his website here: Organic Pools DIY Manual. He has also produced a 90 minute DVD that takes you through all the construction steps. David is currently building a natural pool with Ben Law at Ben's woodland roundwood cottage in Prickly Nut Wood. There is a much simpler and cheaper way to create a pond but it can take several years before it will permanently hold water. Gleying is an old method that mimics the way ponds form in nature. The goal is to produce an anaerobic layer in the soil underneath the pond which prevents water from percolating through. 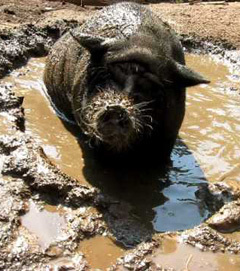 Here are some tips for gleying a pond using pigs.